Over 100,000 happy pain free patients. Find your relief today! Physical Therapy in Rockwall is not hard to come by. There are a handful of different chiropractors and physical therapy clinics in rockwall. Many of these are great for recovering from a sport injury or a automobile accident, but there are cases where the physical therapy doesn’t quite do the job for your injured back. At What - A - Relief, our main goal is to bring our customers the most relief to their back pain that we can. We work alongside rockwall chiropractors, rockwall surgeons and physical therapy clinics in rockwall, we don’t aim to compete against these clinics as we are a program that works hand in hand with them. It is always recommended that you receive approval from either you physician, chiropractor or surgeon, that would allow you to enroll in the W.A.R. program. Our program is a 6 to 12 week course in which a customer would come only twice a week for approximately 15 to 30 minutes on each session. Rockwall Chiropractors send their patients to us so that they can strengthen the muscles around their spine to go along with the work that they would receive at the chiropractor's office. Come stop by our new Rockwall back pain clinic or visit us online at WAR. You can even call today to set up your free consultation, that's right FREE! Just call 1-214-A-RELIEF and an operator will be ready to assist you. Back pain, and how you can relieve lower back pain is constantly a top searched keyword. This is because nearly everyone experiences a sort of back pain in their lives. 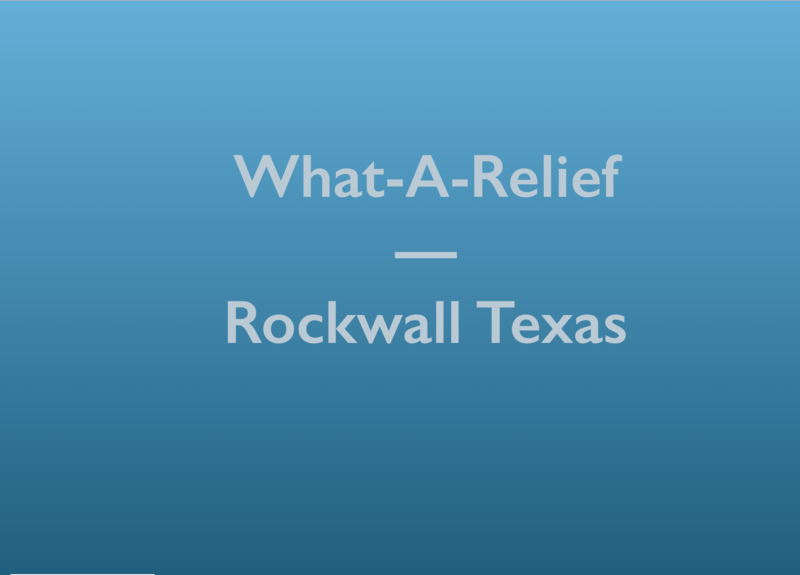 With the new What-A-Relief parent office coming to Rockwall Texas, thousands will now find a much better, long-term, natural relief compared to what they might find at other places. Such as Rockwall chiropractors, Texas back institute of Rockwall, Physical therapy in Rockwall and Back surgeons Rockwall. They will all try to compete with the results you will see at WAR. Although not everyone will be in need of the WAR machines, there will be plenty who are going to experience a superior outcome than that of what they might find elsewhere. This great news for Rockwall back pain patients.